Otosclerosis is a primary disorder of the bony labyrinth and stapes in humans. The most commonly affected location is only anterior of the oval window (antefenestral otosclerosis), causing bone formation around the oval window, and stapes footplate fixation, resulting in a conductive hearing loss,. The conventional treatment is stapes surgery with piston insertion,. This method facilitates the restoration of the conductive component of hearing loss. Sensorineural hearing loss (SNHL) occurs in 10% of otosclerosis patients due to disease involvement of the lateral wall of the cochlea and secondary involvement of the organ of Corti,. Patients with moderate-to-severe mixed hearing loss experience limited benefits from stapes surgery due to the sensorineural component of the disease, and require hearing aids as a salvage management after stapes surgery,. The Vibrant Soundbridge ®(VSB) (MED-EL Hearing Technology, Innsbruck, Austria) is a middle ear implant system that has been employed to correct moderate-to-severe SNHL. The VSB system consists of a floating mass transducer (FMT), which transduces acoustic energy into the inner ear,. In 2006, Colletti et al. published the early results of seven hearing loss patients treated with an FMT placed on the round window (RW). Treating otosclerosis with RW vibroplasty has shown the positive short-term results . However, the RW is the second most common area involved in the progression of otosclerosis , and the long-term results of RW have not been reported in the literature. In addition, in RW vibroplasty, sound waves reach the inner ear through the RW instead of the oval window, which is the natural pathway . For these reasons, vibroplasty designed in another pathway has been considered. Piston surgery coupled with incus vibroplasty was first performed by Dumon in 2007 . A two-staged or one-stage piston coupled with incus vibroplasty is now a treatment option for patients with otosclerosis with mixed hearing loss,. However, limited hearing restoration was revealed in the previous studies and complications have been reported,. There has been little discussion of the efficacy and safety of a one-stage piston with incus vibroplasty in existing research. Incus vibroplasty with VSB implantation before piston surgery in a one-stage operation is a pioneering concept to reduce the risk of inner ear injury during the operation. However, the clinical audiological outcomes remain unclear. Hence, to help fill this gap in knowledge, we investigated the audiological outcomes after a one-stage piston coupled with vibroplasty. A series of patients with otosclerosis with moderate-to-severe SNHL receiving a one-stage piston coupled with incus vibroplasty will be presented in this study. The aim of this study is to elucidate the surgical techniques, audiological outcomes, and complications associated with a one-stage piston coupled with incus vibroplasty in patients with moderate-to-severe otosclerosis. This retrospective study was performed in the Otology Department at three tertiary referral hospitals. Nine patients with Shambaugh's classification Grade IV otosclerosis, with a bone-conduction hearing threshold of at least 40 dB and an air-bone gap at least 30 dB, underwent simultaneous piston surgery and incus vibroplasty between January 2009 and February 2012. Five patients underwent the surgery in Central Clinic (Rovereto, Trento, Italy). One patient received consultations at both Hualien Tzu Chi Hospital and Taichung Tzu Chi Hospital and underwent surgery at Taichung Tzu Chi Hospital (Taiwan). The remaining three patients underwent the surgery at Taichung Tzu Chi Hospital (Taiwan). Their medical records were reviewed. The diagnosis of otosclerosis was confirmed based on the patient's medical history and the results of temporal bone high-resolution computed tomography. The nine patients included four men and five women; five were Asian and the others were Caucasian. The mean duration of hearing loss was 15.6 ± 5.7 years. The mean age at surgery was 46.4 ± 8.8 years (age range, 34–63 years). None received sufficient functional gain from conventional hearing aids before surgery. None of the patients had previous ear surgery. In this study, we compared the preoperative and post-operative audiological results of simultaneous piston surgery and incus vibroplasty. All patients were followed up for at least 6 months. All patients underwent surgery under general anesthesia. A simple retroauricular incision was made, and the posterior -based flap was elevated to expose the mastoid process. Middle ear cavity VSB implantation was performed by a conventional canal wall-up mastoidectomy and posterior tympanotomy. The tympanotomy was enlarged to ensure sufficient space for passage of the FMT. The FMT was crimped by its clip to the distal end of the long process of the incus. The tympanomeatal flap was then elevated. The middle ear and ossicular chain, including the suprastructure, were well exposed. The stapes suprastructure was then removed. Next, a stapedotomy was performed using a CO2 laser. A 0.4-mm diameter prosthetic piston of an appropriate length was fixed between the incus and the stapedotomy site. The additional aponeurotic fascia was placed around the footplate to ensure the stability of the piston. The continuity of vibration was verified using fine manipulation of the FMT and the incus by a Rosen needle. The continuity of sound transduction was examined by touching the incus with the needle [Figure 1] and [Figure 2]. The FMT cable was fixed in the proximity of the posterior tympanotomy passage with bone cement. Eight weeks after the surgery, the audio processor of the VSB system was activated. 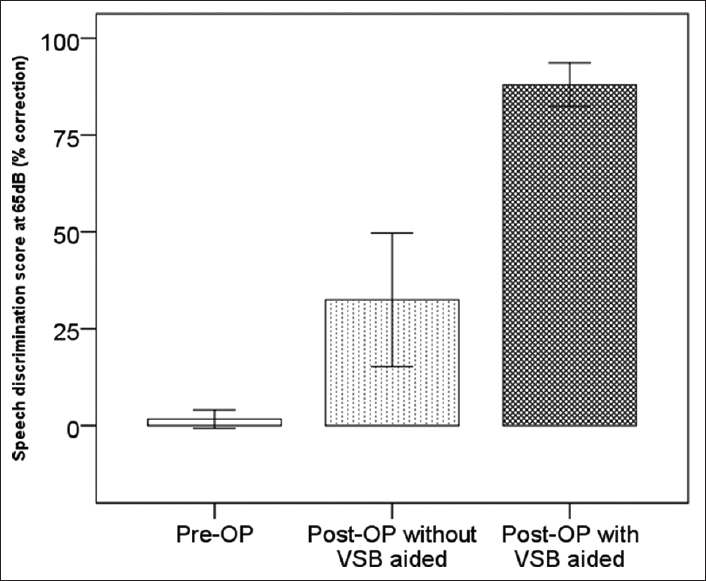 Audiometric evaluation included preoperative and postoperative pure-tone audiograms, preoperative and postoperative speech tests, and with and without VSB activation. Preoperative pure-tone thresholds were measured through air conduction (AC) and bone conduction (BC) in the implant ear with headphones, with the contralateral ear masked. 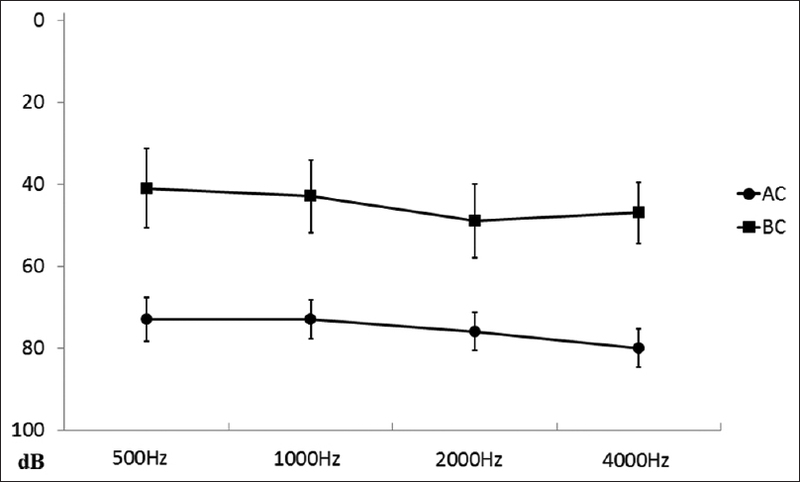 Significant changes in the pure-tone threshold were defined as a variation of 5 dB at the main speech frequency (500–4000 Hz). The postoperative unaided/aided AC thresholds under free field and unaided BC thresholds were measured. The free-field measurements were made with the nonimplanted ear plugged with a noise attenuator insert. Speech tests were including the speech-reception threshold (SRT) and speech discrimination score. The SRT test was conducted under aided and unaided conditions at 65 dB. All tests were conducted in a sound-treated room. A paired t-test was used to compare the preoperative and postoperative hearing levels, which were expressed as the mean and standard deviation (SD). All statistical analyses were performed using JMP 5.0 software (SAS Institute Inc., Cary, NC, USA). Statistical significance was set at P < 0.05. This study was conducted in accordance with the Declaration of Helsinki and was approved by the Local Ethics Committee of the institution (REC106-40). Informed written consent was waived because the study was a retrospective data analysis. The clinical characteristics of these patients are shown in [Table 1]. All nine patients had either an A or As-type tympanogram, which showed absent acoustic reflexes. The mean preoperative pure-tone AC threshold and SRT in the surgical ear were 75.6 ± 4.7 dB (mean ± SD) and 78.9 ± 4.9 dB, respectively. The BC threshold was 45.0 ± 8.8 dB, and the air-bone gap was 30.3 ± 5.6 dB [Figure 3]. After surgery, without activation of the VSB, the AC hearing level and SRT improved to 56.4 ± 6.7 dB and 67.2 ± 9.7 dB, respectively. The air-bone gap also decreased from 30.3 ± 5.6 dB to 9.3 ± 9.3 dB [Table 2]. 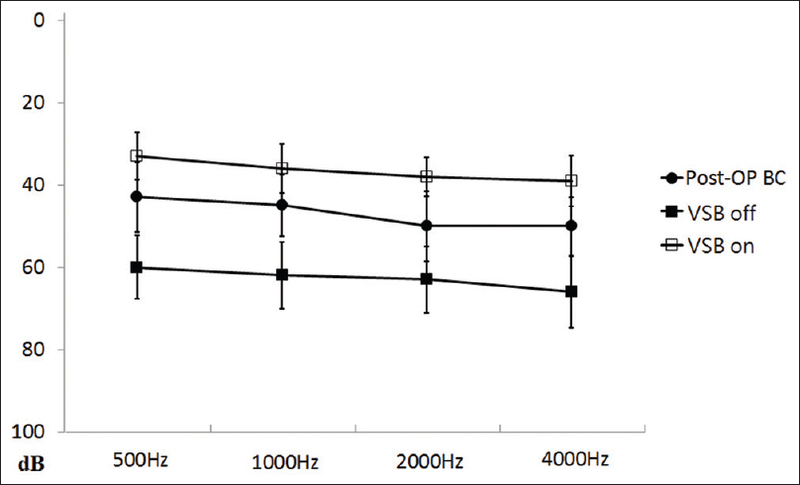 The BC hearing levels did not significantly change across the frequencies [Figure 4], which suggested the absence of inner ear damage during implantation. After the activation of the VSB, the mean AC threshold in the free field was 36.4 ± 5.5 dB [Figure 5]. 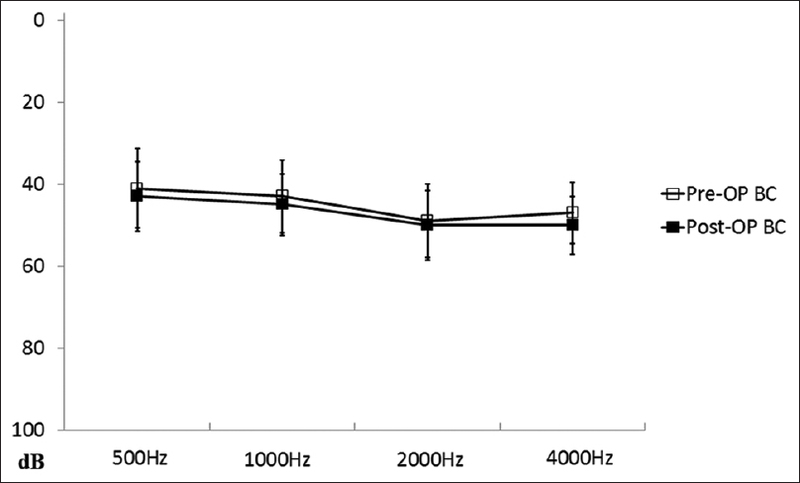 The mean AC hearing improved 39.2 dB with VSB activation. The postoperative free-field speech recognition improved from 1.6% to 32.4% at 65 dB. With the aid of the VSB, it improved to 88% [Figure 6]. The SRT substantially improved from 79 dB to 67 dB on average after surgery. With the aid of the VSB, the SRT further improved to 40 dB [Figure 7]. The present study is preliminary research on the efficacy and safety of a one-stage piston coupled with vibroplasty, but its relevance to the audiological outcomes warrants further investigation. A major finding is that there was no further significant SNHL after this surgery. The results indicate that there was no significant injury to the inner ear before or after the surgery. It is reasonable to infer that the stapedotomy and piston placement after the FMT was clipped, which allowed an appropriate size piston to be chosen, and decreased the probability of inner ear trauma. In this study, all nine patients had satisfactory hearing gain without any early or late complications after this surgery. 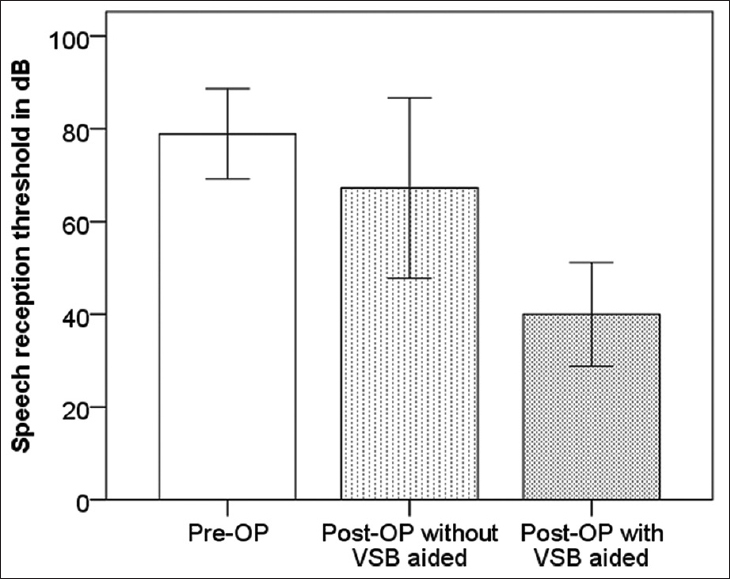 With VSB, the postoperative mean AC threshold in the free field was 36.4 ± 5.5 dB. In contrast, in a previous study in 2007, Venail et al. have reported their first experience with one-stage piston surgery coupled with incus vibroplasty, and one of their two patients developed labyrinthitis and profound SNHL with an unclear etiology shortly after implantation. They suggested staged rather than combined surgery. In the present study, the BC hearing levels did not significantly change across the frequencies, which indicated that there was no significant injury to the inner ear before or after implantation. VSB implantation before the stapedotomy and piston insertion, which decreased the risk of inner ear trauma, may be a reason why our results were different than those of Venail et al. In the current setting, a proper length piston could be chosen allowing a stapedotomy with gentle piston insertion. With further manipulation after piston insertion, i.e. VSB implant, the inner ear, and labyrinth may be vulnerable to injury caused by the additional coupling mass from the FMT. 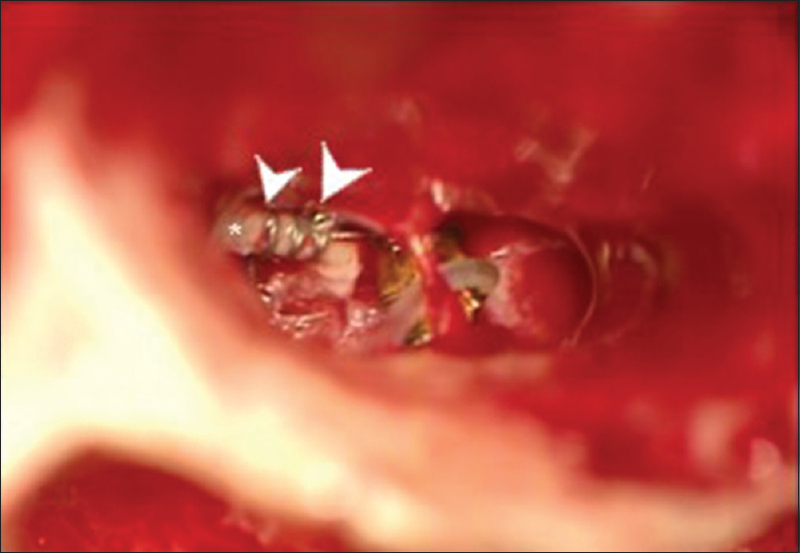 Implantation performed before the stapedotomy prevents energy passing through opened footplate and minimizes the possibility of labyrinthitis and inner ear trauma. In 2007, Dumon reported the successful use of one-stage piston surgery coupled with incus vibroplasty in an otosclerosis patient with Shambaugh's classification Grade IV hearing loss . The result was good, but improvement in high-tone hearing was limited. A possible explanation for the difference between studies might be the different procedures used. Dumon reported the removal of the stapes suprastructure and stapedotomy was performed first and covered with a vein graft, followed by VSB implant, and then, the piston was finally placed. In contrast, the removal of the stapes suprastructure and the stapedotomy were done only before piston insertion in the present study. Even though it was covered with a vein graft, the footplate was opened and sustained injury or contamination longer in Duman's study than it did in the method reported in this study. The results of this retrospective study in nine patients who received simultaneous one-stage piston-coupled incus vibroplasty suggested there was no further significant injury to the inner ear before or after the surgery. These results lend some credence to the hypothesis that the surgery reported in this study may minimize the risk of inner ear labyrinth injury and results in a better high-tone hearing restoration. However, limited results are available in current studies to elucidate the factors contributing to high tone hearing restoration and further investigation is warranted. There are several concerns regarding the use of piston surgery with VSB during one-stage surgery for patients with otosclerosis. Dumon combined transcanal and retroauricular approaches, whereas Venail only operated through the transcanal approach. We are familiar with both these approaches and preferred to use them together to reduce the complications and improve the success rate. Otherwise, after the transcanal approach alone, the wire of the FMT could bulge above the thin skin of the external ear canal. During the operation, due to the tiny hole made during the stapedotomy, the piston was hooked on the incus before the FMT was fitted. Although the piston might be close to the lenticular process, some space remained for the FMT to be clipped onto the incus. Care should be taken to avoid overlapping of the two prostheses because it may cause the latter hooked prosthesis to loosen. Complications occurring during or after middle ear implantation are rare, and are caused by the surgical approach or by the presence of foreign bodies in the middle ear. The long-term effects of middle ear implantation are poorly understood. Shea et al. reported one case of erosion of the long process of the incus 4 years after VSB implantation. The incidence of this complication is unknown, but it is well established that it may also occur after stapes surgery . We believe long-term implantation failure may be seen more frequently in middle ear surgery. To be alert to this complication, frequent monitoring of the hearing threshold, especially focusing on the air-bone gap, is warranted. A long-term survey should be performed to uncover other types of late complications. Vertigo is a common operative complication of piston insertion associated with excessive length of a piston . Other signs associated with excessive length of a piston including sensations of instability and SNHL. In addition to the clinical symptoms, a natural propensity for inward–outward movement of the prosthesis in the vestibule needs to be taken into account to avoid choosing a prosthesis that is too short or too long. Changes in atmospheric pressure produce displacement of the prosthesis, which has been shown to reach a maximum of 0.5 mm  In our experience, after the FMT is attached to the incus, a little medialization of the prosthesis into the vestibule occurs and makes it more difficult to choose an appropriate length piston before VSB implantation. No vertigo was observed in our nine patients after the operation. No evidence of excessive prosthesis length or prosthesis medialization has been seen. It is not necessary to choose a piston prosthesis shorter than actual distance during one-stage piston surgery coupled with incus vibroplasty. In our series, one-stage surgery proved to be a safe and satisfactory treatment option for otosclerosis patients with Shambaugh's classification Grade IV hearing loss. All our patients were satisfied with the results of the surgery; although, immediate intolerance to the high hearing gain from high amplification of the vibroplastic system occurred in three patients. During the initial activation of VSB, patients were more comfortable with a smaller amplification for a few months, which was then gradually increased. In comparison to traditional stapes surgery, this combination surgery provided better outcomes and improved the mean AC threshold from 56.4 ± 6.7 dB to 36.4 ± 5.5 dB. For Grade IV otosclerosis, this one-staged surgery could be considered an alternative to cochlear implantation (CI). The overall results are comparative to CI, and the combined surgery also provides partial audiological gain all the time even when the VSB is off. Further studies in a larger series of patients with a longer follow-up period should be conducted to assess late complications and the long-term efficacy of our suggested treatment. Although the results of the present study have both theoretical and practical implications, the design is not without flaws. First, this observational study only compared audiological outcomes before and after surgery and lacked a control group. This limits further inference of possible factors contributing to the surgical results. Second, the study design resulted in difficulty in case recruitment. The problem was compounded by the small patient population and unusual clinical scenario. To be enrolled in this study, the patient had to have advanced otosclerosis with moderate-to-severe SNHL without previous middle ear intervention. Before the development of SNHL in otosclerosis, there may be a period with conductive hearing loss alone, which may be corrected with piston surgery, making it difficult to recruit a naïve advanced otosclerosis patient. Other limitations such as the short follow-up period, lack of assessors blind to the intervention, and the retrospective nature of the study also limit the usefulness and implications of this study. The surgical technique and design in piston coupled with vibroplasty for otosclerosis are still very much in the experimental stage and much more has to be done. Much more also needs to be known about the factors, which facilitate the audiological outcomes in this surgery. This study should provide a descriptive basis for additional research. Further, the investigation for an adequate theoretical basis for the practical application of surgery in otosclerosis is warranted. Piston surgery alone is not sufficient to restore hearing loss in otosclerosis patients with moderate-to-severe SNHL. The safety of one-stage piston surgery coupled with incus vibroplasty was revealed in the present study, and the surgery showed efficacy in restoring hearing loss in this population. Further, the study to investigate the details facilitating hearing loss restoration in the otosclerosis population is warranted. Guild SR. Incidence, location and extent of otosclerotic lesions. AMA Arch Otolaryngol 1950;52:848-52. Rama-López J, Cervera-Paz FJ, Manrique M. Cochlear implantation of patients with far-advanced otosclerosis. Otol Neurotol 2006;27:153-8. Perkins RC. Laser stepedotomy for otosclerosis. Laryngoscope 1980;90:228-40. Shea JJ Jr. The teflon piston operation for otosclerosis. Laryngoscope 1963;73:508-9. Rotteveel LJ, Proops DW, Ramsden RT, Saeed SR, van Olphen AF, Mylanus EA,et al. Cochlear implantation in 53 patients with otosclerosis: Demographics, computed tomographic scanning, surgery, and complications. Otol Neurotol 2004;25:943-52. Ruckenstein MJ, Rafter KO, Montes M, Bigelow DC. Management of far advanced otosclerosis in the era of cochlear implantation. Otol Neurotol 2001;22:471-4. Cureoglu S, Baylan MY, Paparella MM. Cochlear otosclerosis. Curr Opin Otolaryngol Head Neck Surg 2010;18:357-62. Redfors YD, Möller C. Otosclerosis: Thirty-year follow-up after surgery. Ann Otol Rhinol Laryngol 2011;120:608-14. Smyth GD, Hassard TH. Hearing aids poststapedectomy: Incidence and timing. Laryngoscope 1986;96:385-8. Shea JJ Jr. Forty years of stapes surgery. Am J Otol 1998;19:52-5. Lenarz T, Weber BP, Mack KF, Battmer RD, Gnadeberg D. The vibrant soundbridge system: A new kind of hearing aid for sensorineural hearing loss 1: Function and initial clinical experiences. Laryngorhinootologie 1998;77:247-55. Luetje CM, Brackman D, Balkany TJ, Maw J, Baker RS, Kelsall D,et al. Phase III clinical trial results with the vibrant soundbridge implantable middle ear hearing device: A prospective controlled multicenter study. Otolaryngol Head Neck Surg 2002;126:97-107. Colletti V, Soli SD, Carner M, Colletti L. Treatment of mixed hearing losses via implantation of a vibratory transducer on the round window. Int J Audiol 2006;45:600-8. Rajan GP, Lampacher P, Ambett R, Dittrich G, Kuthubutheen J, Wood B,et al. Impact of floating mass transducer coupling and positioning in round window vibroplasty. Otol Neurotol 2011;32:271-7. Carmine C, Susan S, Michael G, David NF, Sue B, Juan CF, et al. Gray's anatomy of the human body. 41st ed. Elsevier Health Science 2015;4:38-9. Dumon T. Vibrant soundbridge middle ear implant in otosclerosis: Technique – Indication. Adv Otorhinolaryngol 2007;65:320-2. Venail F, Lavieille JP, Meller R, Deveze A, Tardivet L, Magnan J,et al. New perspectives for middle ear implants:First results in otosclerosis with mixed hearing loss. Laryngoscope 2007;117:552-5. Beltrame AM, Martini A, Prosser S, Giarbini N, Streitberger C. Coupling the vibrant soundbridge to cochlea round window: Auditory results in patients with mixed hearing loss. Otol Neurotol 2009;30:194-201. Hüttenbrink KB. Biomechanics of stapesplasty: A review. Otol Neurotol 2003;24:548-57. Hüttenbrink KB. Biomechanics of stapesplasty: A review. Otol Neurotol 2003;2:548-59.